The New England states are known for their color this time of year. Vibrant reds and golds brighten the skylines and bring tourists near and far. I love it there, and long to visit every year. California on the other hand puts on a subtle show. 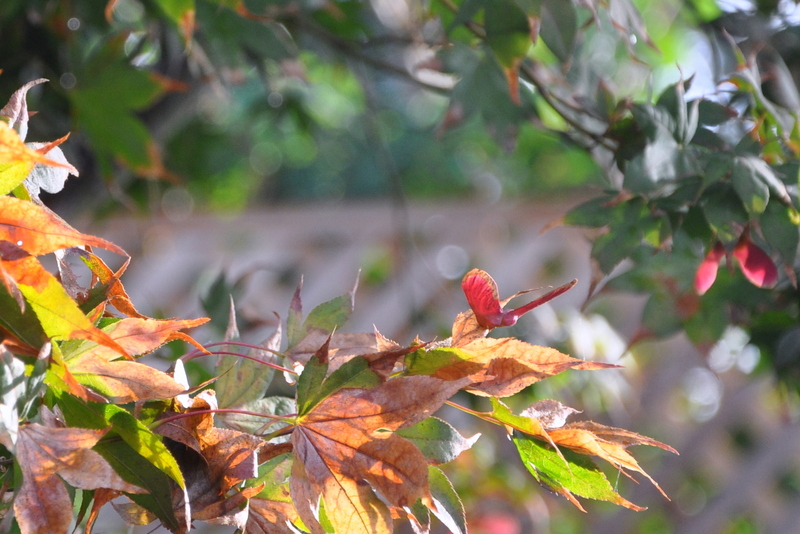 Here’s a peek from my backyard as the garden folds up shop for the approaching winter. 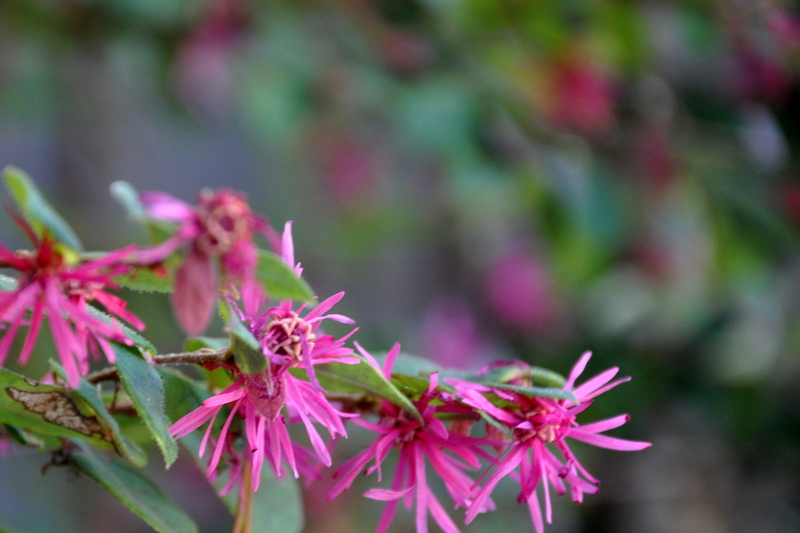 The Fringe Flower is covered in fuchsia blooms this time of year. They remind me of miniature pom-poms. I love their brilliant color. 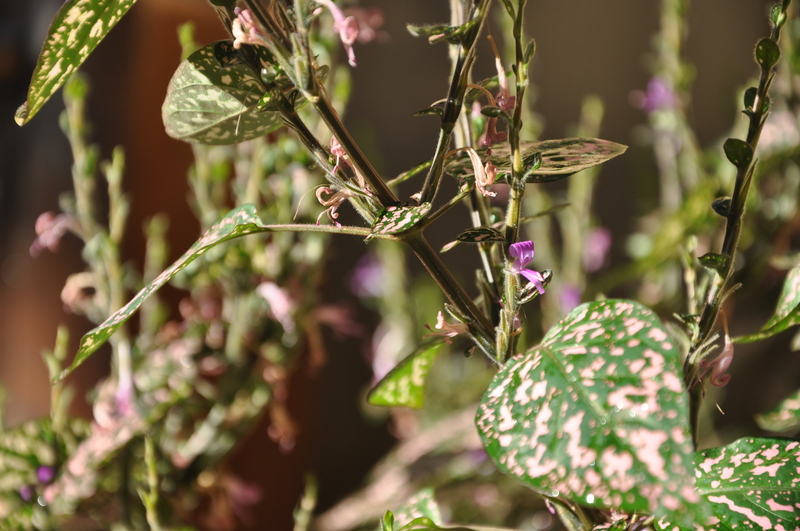 Polka dot plants are commonly grown indoors. I bought a few for my fairy garden three summers ago, then transplanted them when they got too large for the area. Little did I know that they would come back year after year, bigger and better than the last. In mid-October they start producing these tiny purple flowers. They’re hard to photograph against the busy background, but they catch my eye in the morning, autumn sun. 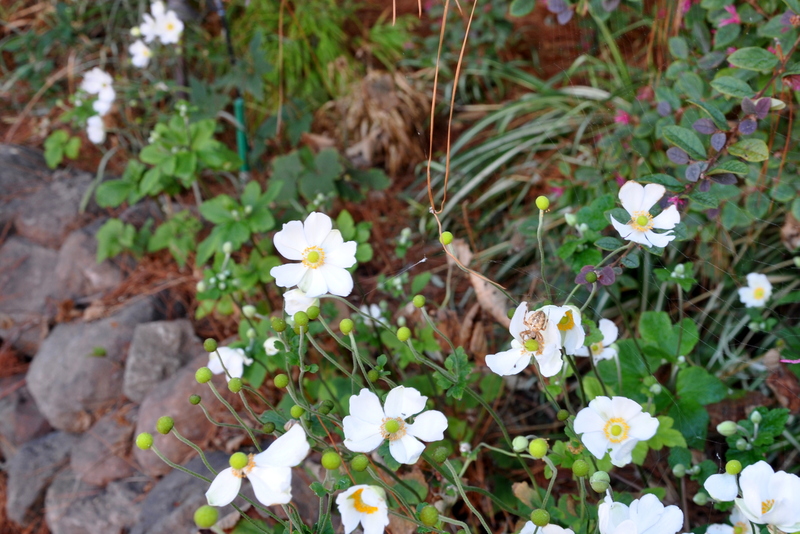 These brilliant white anemones produced a fraction of their usual blooms this year. They tolerate a lot of conditions, but they don’t like droughts. 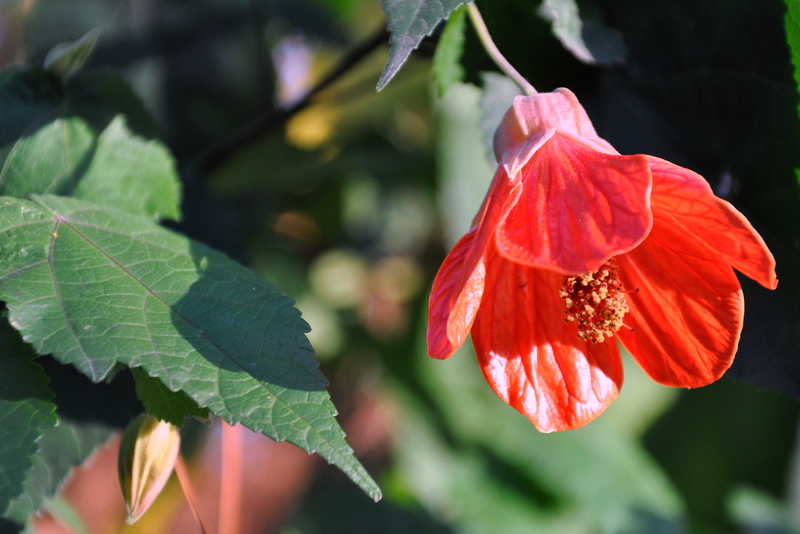 They generally bloom profusely in August, yet here they are blooming in mid-October doing their best to survive. 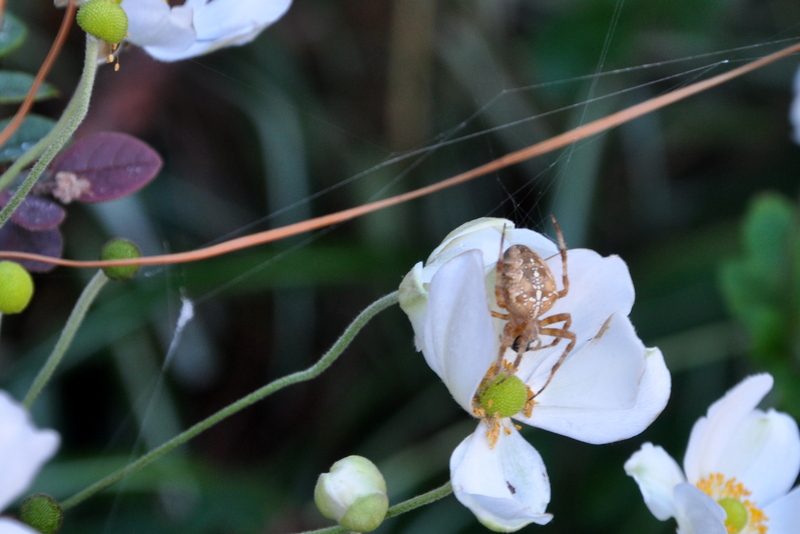 That’s an Orb Weaver spider, hanging out on the flower. He’s bathed in the traditional fall colors but that’s nothing new. He’s the same color year round, but seems to show up in our garden around this time. He’s not camouflaging at all, but I guess if you’re the biggest spider on the block, you can show off on the tip of a white bloom whenever you want to. 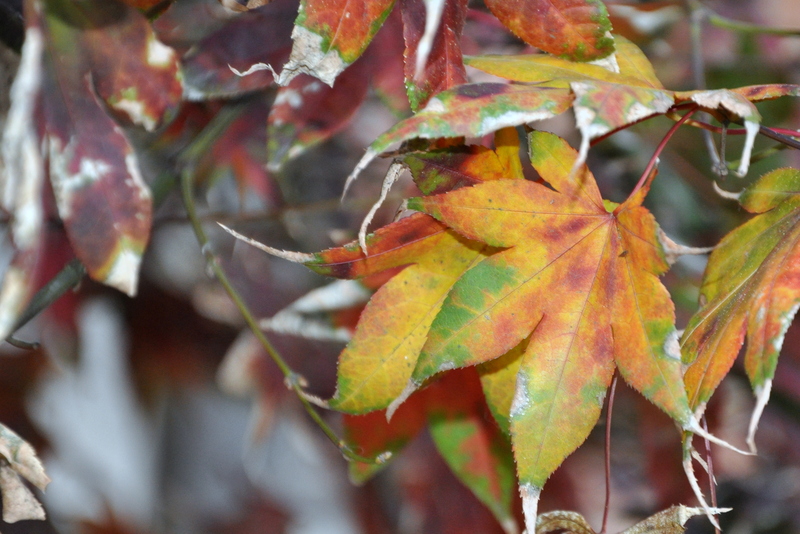 Our Japanese Maple Acer produces rich red seed pods and variations of amber leaves. It’s one of two deciduous trees in our yard. I look forward to the color changes every year. 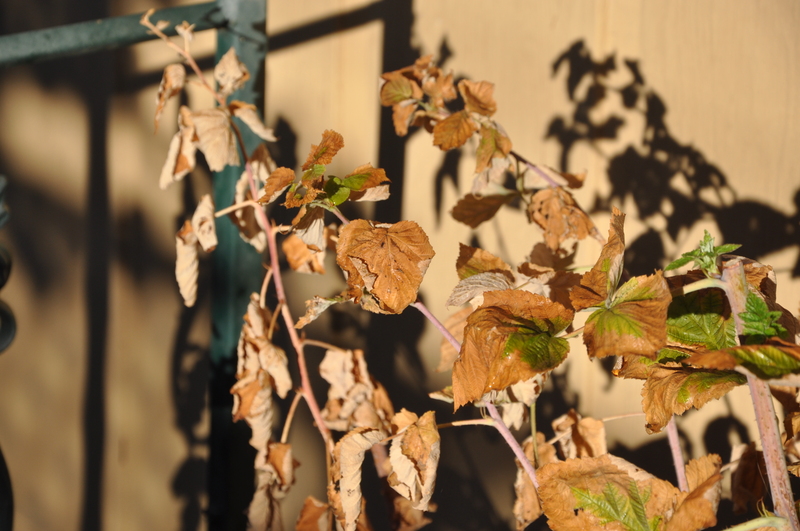 And finally, here are my raspberry vines, dying back for the winter. I missed those warm, fresh berries straight from the vine this year, along with fresh tomatoes, sunflowers and summer annuals. Some of you are heading into fall this month, and others are ushering in spring. What color heralds the arrival of your new season? A graceful Acer hugs the side of our house; a stunning specimen of a tree. 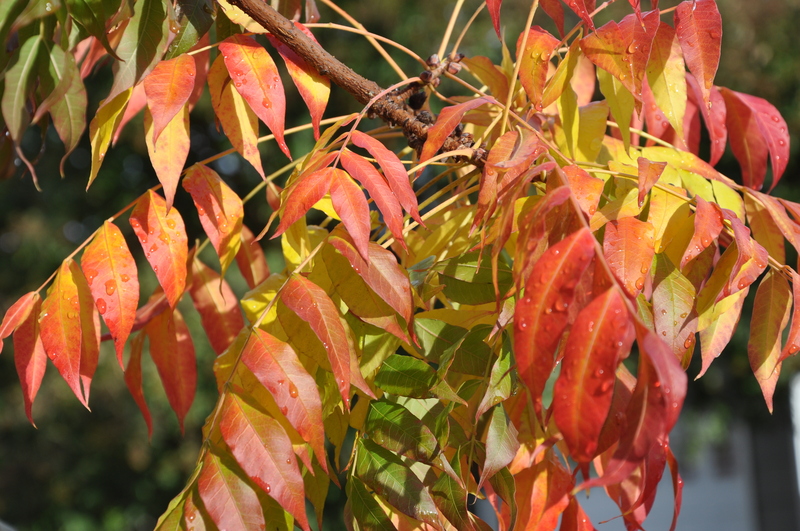 Long, green limbs branch out low from the trunk, giving way to seven-point leaves. It’s taller than our one-story house, and big enough to provide shade. As much as I love the changing colors this time of year, I also feel a little wistful. Though we left Ontario, Canada when I was 7, I feel a cultural tug to my Canadian heritage. Shorter, cooler days and the lovely hues of fall make me a little homesick for my place of birth. Crazy, eh? 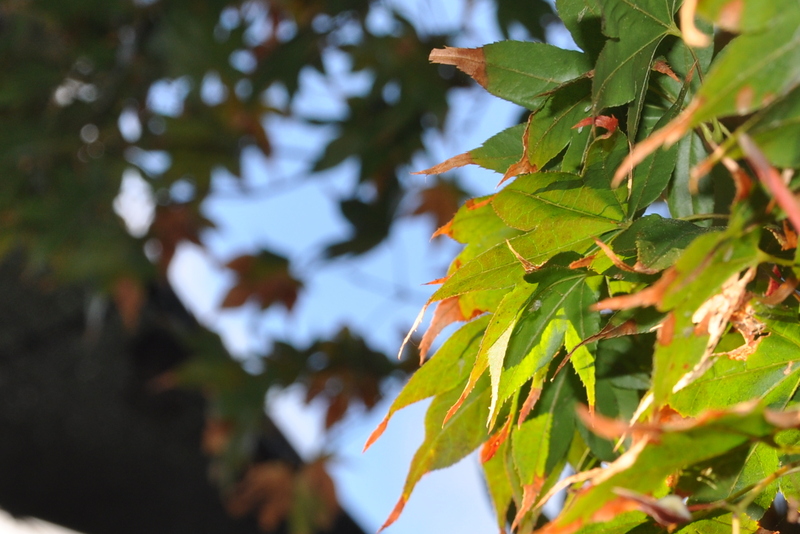 Our maple tree is an Acer palmatum, also known as a Japanese Maple. In our arid climate, home to year round citrus trees, the Acer serves as a lovely demarcation of the four seasons. In the spring and summer months, it offers shade for the patio. It shelters part of our living room from the blaring summer sun. I can see the tree from our bedroom, entry way, living room and of course the garden. Hummingbirds rest on the branches, waiting for a turn at the feeder. Cheeky squirrels hide their nuts in the ground under the tree’s canopy. Just yesterday two of the cats took turns sleeping under the tree. Who knows what that was about. Now it’s autumn’s turn in the spotlight. Leaves are changing to more vibrant hues. 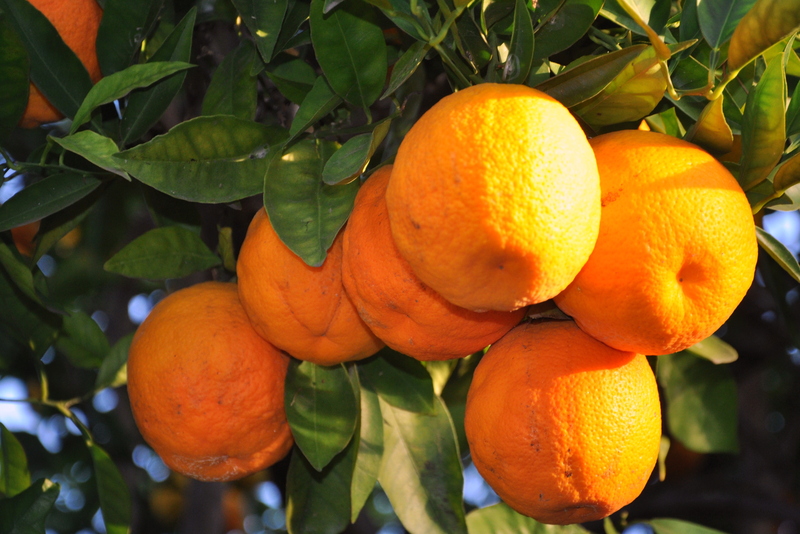 The fruit, known as samaras, populate the tree. Since frosts are rare, our Acer holds on to its leaves for quite a while. Last year, with so little rain, the dead leaves clung to the branches well into winter. You could see all the new leaf buds forming at the same juncture. Occasionally I gave the tree a gentle shake so I could enjoy the rustle of crisp leaves scraping past the branches in a graceful free-fall. It’s a gorgeous specimen, year round, but in these early fall days, it reminds me of a place I used to call home.